When appointing a CEO, firms can choose a newcomer or someone who has been at the firm for a long time. Using data on Portuguese firms in the wake of the Global Crisis, this column finds no performance gap between newcomers and experienced CEOs in the period prior to the crisis. During the crisis, however, firms run by newcomer CEOs outperformed those run by experienced insiders. Newcomers attain higher productivity by making different decisions regarding personnel, expenditure, investment, and international trade. How do CEOs spend their time? One of the most important questions all corporations face is which CEO to hire. In this selection process, firms consider the trade-offs involved in choosing between a newcomer and an experienced insider. A newcomer – that is, a recent external hire – may bring innovative and bold initiatives to the management of the firm, but will start with a knowledge deficit and will need time to reap the benefits of learning by doing. On the other hand, an experienced insider already has already mastered ‘business as usual’, but might find it difficult to abandon settled management practices when challenging circumstances arise, and may fall prey to the ‘experience trap’. 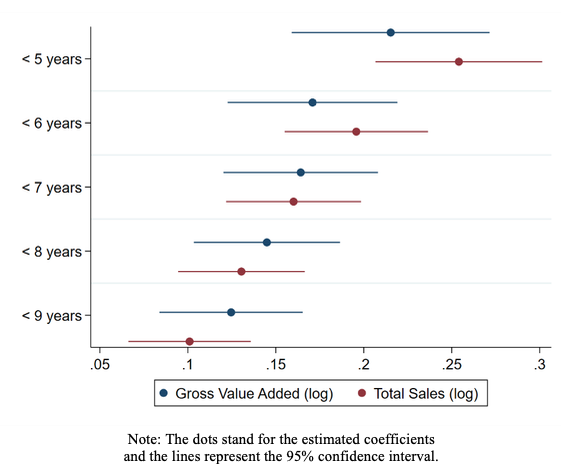 Firms choose their CEOs along the tenure-origin locus, so as to maximise the net value of their inter-temporal performance, for a given set of expectations about the future. However, when unexpected circumstances – such as a major crisis – do materialise, the ex-post optimal mix of CEO characteristics changes. Under a major shock, old management practices and strategies may be insufficient to innovate and generate growth, exactly as taking risks and adopting creative solutions becomes more valuable. The literature has highlighted the inverted U-shaped impact of CEO tenure on firm performance (Hambrick and Fukutomi 1991, Luo et al. 2013). With time, as CEOs become myopic, risk-averse and overly wedded to early formulas, tenure starts to hurt firm performance (Henderson et al. 2006). Other researchers have analysed the impact of hiring an outsider, as opposed to an internal promotion, but have not reached a consensus as to the relative impact on firm performance. So far, the literature has ignored how the value of newcomers changes in times of severe crisis, when the risks of an experience trap gain relevance. In a recent paper (Sazedj et al. 2018), we estimate the impact of newcomer CEOs on firm performance – measured as gross value added (GVA) or total sales – during the economic and financial assistance programme in Portugal. We focus on a period of serious economic downturn, which was unexpected and unprecedented in nature, reach and magnitude, and exogenous to firms, and make it the basis of the identification strategy. The depth and unexpected nature of the crisis precluded pre-emptive actions on the part of firms, including anticipatory CEO hires. The great majority of firms did not change CEO before the onset of the crisis. We consider having a newcomer in office when the crisis hit as an exogenous event, and use this to disentangle the impact on firm performance from other correlated and unobservable factors. Our analysis is based on a micro-level merged employer-employee dataset, covering the universe of firms and employees in Portugal. We use empirical methods such as differences-in-differences and nearest neighbour matching estimators to control for time variant observable CEO and firm characteristics, and time invariant firm heterogeneity, in order to estimate the relative performance gap of newcomer CEOs during normal times and during a major crisis. We define a newcomer as an externally hired CEO with fewer years of tenure at the job than the median CEO in the sample. In the period prior to the crisis, we find no significant performance gap. This suggests that unobservable differences between newcomers and other CEOs, such as risk preferences or different incentives, play a minor role during normal times, when conducting business as usual is sufficient and innovative management practices are not key (see Figure 1). Yet, when the crisis sets in, we do find evidence of better performance by newcomers, with a significant performance gap, close to 18% in sales and value added. Under extraordinary circumstances, when truly put to the test, previous redundant unobservable differences are magnified and play a major role in how CEOs handle the negative shock. Our empirical findings are extremely robust. They continue to hold when we include different sets of controls, fixed effects, and across firm samples, including different number of CEOs and different CEO-owner combinations. Note: The dots stand for the estimated coefficients and the lines represent the 95% confidence interval. In Figure 2 we consider different thresholds for CEO tenure in the definition of newcomer. We find evidence that the performance gap associated with external hires during the crisis is larger the stricter our newcomer definition. In other words, the more recent the hiring, the larger the estimated positive impact on firm performance during the crisis. The fact that the estimated coefficient increases monotonically as more recently tenured CEOs are considered is a striking result. It suggests a clear inverse relationship between CEO tenure and firm performance during a crisis. We also find robust evidence that newcomer CEOs increase the firm’s survivability during the crisis. This is another piece of evidence of better performance, while also confirming that our previous results were not driven by the selection of surviving firms. 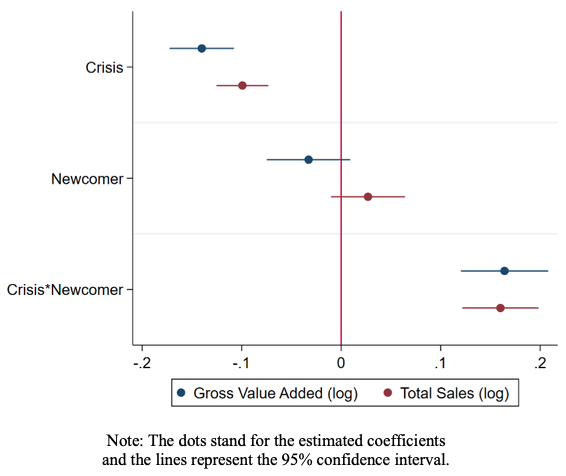 So far we have uncovered a positive impact of newcomer CEOs on firm performance during a crisis in terms of higher total sales, higher value added and higher probability of survival. A different, important issue is the impact of newcomers on a firm’s productivity levels. Management practices are relevant for productivity, particularly so in times of uncertainty and crisis. Several authors have found a robust link between management practices and firm productivity (Bloom and Van Reenen 2010, Bloom et al. 2016). In our analysis, we consider three indicators of productivity: apparent labour productivity, measured as GVA and sales per worker, and GVA per unit sold. Using a nearest-neighbour matching estimator, we compare the performance of each firm run by a newcomer during the crisis, with the most similar firm – in terms of observable firm and CEO characteristics and performance prior to the crisis – run by a non-newcomer. We find that between 7% to 9% of the differences in productivity in the crisis period can be explained by having a newcomer CEO. This is a quantitatively significant difference in performance. Bloom et al. (2016) estimate that differences in management practices account for about 30% of productivity differences between countries as well as within countries and across firms. In times of crisis, we argue, almost one third of these differences can be explained solely by the type of CEO hired. 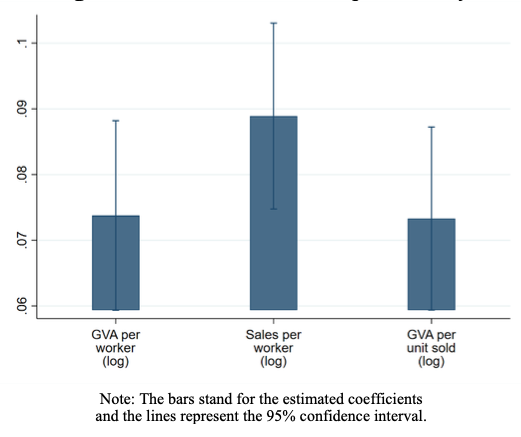 Note: The bars stand for the estimated coefficients and the lines represent the 95% confidence interval. Our results question traditional definitions of human capital based on seniority and tenure, arguing for differences in value in times of crisis. At the very least, we suggest that accumulated experience in the firm is not key in periods of economic distress, when compared to a newcomer CEO’s willingness to take risks and innovate. Flexibility, adaptability, or risk preferences – characteristics that we cannot directly observe, but which are more likely to be present among newcomers – are more valuable than experience when firms are faced with a crisis. Different mechanisms may explain our findings. Newcomers are less familiar with current business practices and more likely to draw on their diverse experience in other firms. Moreover, the incentives a newcomer CEO faces are also different. A better performance by a newcomer CEO may associate with a higher net benefit in case of good performance in his initial years, when uncertainty regarding ability and suitability for the job are higher. The incentives line up for a recently hired CEO to risk more in face of new circumstances. In addition, good performance delivers benefits for a longer period, as a new manager in a given firm faces a longer expected horizon at the job. We conduct a preliminary analysis on the mechanisms behind newcomers’ success in times of crisis. With no claim to causality, our analysis uncovers differences in performance which map to different management practices concerning costs, employment, trade openness, investment, and financing decisions. In particular, these firms are associated with a higher accumulation of capital during the crisis, stemming from higher investment, and have easier access to short-term debt and, especially, long-term debt, suggesting a ‘signalling’ value of hiring a newcomer CEO. Newcomer CEOs are able to keep a higher number of workers during the crisis, pay higher wages and incur higher total costs, while becoming more efficient, as they reduce costs per unit sold. Finally, firms managed by newcomers become more open to trade during this period and, more specifically, export a higher share of their total sales. Future research should focus on deepening our analysis of these and other management practices of newcomer CEOs and assess ways to facilitate transitions in top management positions as crises arise or, more generally, to design the appropriate incentives to make CEOs follow the best management practices at all times. Bloom, N, R Sadun and J V Reenen (2016), “Management as a technology?”, National Bureau of Economic Research working paper 22327. Bloom, N and J V Reenen (2010), “Why do management practices differ across firms and countries?”, Journal of Economic Perspectives 24(1): 203-224. Hambrick, D C and G D S Fukutomi (1991), “The seasons of a CEO’s tenure”, Academy of Management Review 16(4): 719-742. Henderson, A, D Miller and D C Hambrick (2006), “How quickly do CEOs become obsolete? Industry dynamism, CEO tenure, and company performance”, Strategic Management Journal 27(5): 447-460. Luo, X, V K Kanuri and M Andrews (2013), “How does CEO tenure matter? The mediating role of firm-employee and firm-customer relationships”, Strategic Management Journal 35(4): 492-511. Sazedj, S, J Amador and J Tavares (2018), “CEO performance in severe crises: The role of newcomers”, CEPR Discussion Paper 13294.